Consider this moral conundrum for a moment. George's mother says to George who's sitting in the front passenger seat. The passenger seat in the hire car is strange, being on the side of the driver's seat is on at home. This must be a bit like driving is, except without the actual, you know, driving. Okay. You're an artist, her mother says. Of the six 2014 Man Booker Prize finalists, Ali Smith's How to be Both might be the most "artistic." I say this with scare quotes because often there is something about art that confounds and irritates many. Whether it is the perceived "extra effort" that is often involved in understanding an art work's (literary, visual, or performance, they are all the same here) merits or that niggling doubt that the viewer/reader just might be incapable of the requisite empathy in order to grasp just how that particular piece came into being, often such works are set aside in favor of more "tried and true," less "difficult" pieces. No, it is not a fair assessment, but it is one that takes place more frequently than any of us are ready to admit. Yet when one does peer closer at the piece in question and when one does encounter something that captivates them, whether it be a line shadowed just so or a le mot juste or a cadence from an actress or singer that tugs at the heart's strings, that person is then drawn into the dialogue that is symbolized by the piece or performance in front of her. How to be Both is at its heart a dialogue that forms across the centuries between a sixteen year-old half-orphaned girl and a fifteenth century Renaissance painter, Francesco del Cossa, whose painting of Saint Vincent Ferrer haunts young George long after her fateful first visit to the Palazzo Schifanoia in Ferrara just a few months prior to her mother's death. It is her life, her changing views on it and on art, coupled with the "voice" of del Cossa through his paintings that George observes, that form a gripping dialogue on just what does ars gratia artis mean in this day and age. How to be Both intertwines these two narratives, one of a modern young woman with her contemporary concerns about how to live with those of fifteenth century Italy and the struggles that del Cossa had in establishing his art, his vision, in a place where the mercenary wars were about to give way a generation later to the ruinous French invasion. Smith does an outstanding job in establishing these two voices, as George and del Cossa's concerns are shown in vivid detail. Smith shapes the narrative to suit this dual voice perspective: there is a mixture of monologue, dialogue, and a bit of stream of consciousness. In a less adroit hand, these elements easily could have collapsed under the weight of their artifice, but Smith manages to meld them together in such a fashion that each complements the other, making for a great read. However, the intricate narrative structure is only just that, a structure around which the story and its themes are constructed. Here too Smith does a fantastic job in establishing character and motivations. The exploration of Art is done in a fashion that does not feel trite or treacly; after all, these two characters have suffered much for their eventual understanding of what Art entails. Each little detail, from hawkers declaiming what they know the piece in question to be to questions of perspective, builds upon each other, creating a literary piece that is stronger than the sum of its already impressive parts. How to be Both is the most daring of the six shortlisted titles on this year's Man Booker Prize. Its language is captivating, its characters are powerfully dynamic despite one not being presented in a "traditional" fashion, its themes are no less ambitious than trying to discern just what "art" truly might be. In a fairly strong field, it holds its own when it comes to being a novel that can be read and re-read multiple times for greater appreciation. It may or may not win the award next week, but How to be Both is certainly one of my two favorites from this year's shortlist. 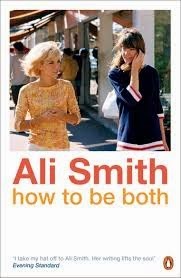 Ali Smith has, I think, been listed for the Booker prize several times now, it's high time she finally won it, as I don't think there can be any reasonable doubt that's among the most consistenly fascinating writers in the English language today. What I enjoy most about her writing is how she manages to combine formal experimentation with emotional depth; I can't think of any other contemporary writer whose work are both intellectually challenging and emotionally involving in such a measure.